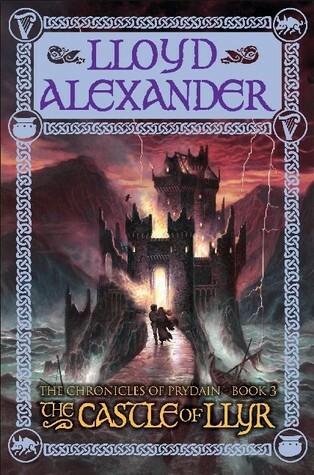 The Castle of Llyr didn’t win any awards, unlike several other books in the series, but it is my favorite one yet. Within, Taran Assistant Pig-Keeper fights not for kingdoms but for the life of his friend, Princess Eilonwy. Containing all the wisdom and adventure of the first two books, this one attains a depth greater than the other two, for it bares Taran’s very soul. The book opens with Dallben’s announcement that the orphaned princess must return to the Isle of Mona, the land of her birth, to be brought up by the new royal family and taught to be a lady (a suggestion, you can guess, that causes Eilonwy to become quite indignant and vocal!). Taran accompanies her on her journey, along with Gurgi, and they meet Fflewddur Flam, my favorite bard, rather coincidentally on Mona. But that coincidence is the only weak moment in the book. Soon after, the warrior Gwydion shows up with a tale of terror. Achren, the evil witch who once ruled Prydain, seeks to regain her kingdom through Eilonwy’s birthright. Eilonwy is in mortal danger. When she disappears, Taran moves heaven and earth to find her, for he realizes just how important the princess has become to him. His heartache doubles, however, when he learns she is to be betrothed to the Prince of Mona. But this tale has nothing whatever to do with romance. It is of deep and lasting friendship, of sacrifice and honor. For this Assistant Pig-Keeper who wishes with all his heart that he’d been born of a station great enough to equal Eilonwy learns that “For a man to be worthy of any rank, he must first strive to be a man.” It contains some powerful messages and some powerful emotions, but it does so in the midst of a rousing adventure. The castle setting in which the showdown with Achren takes place is the most frightening one yet, and the road Taran must take to get there is beautifully complex, fraught with danger and filled with excellent new characters. I would love to read them! If you want, I can trade you for the Nick of Time books. I am not so sure how to do it, so I will ask my Mom what to do. Sounds like a great swap. I’ll email you. I haven’t read any of these books yet and it bums me out because I’m clearly missing something good! I haven’t read this (or these) and don’t think my kids have either! Thank you for sharing about them. I heard of these books quite some time ago, but I’d overlooked them for years. It’s kind of like finding a gem on well-walked trail. I’ve heard of these books, and probably would enjoy them based on your review. Thanks for introducing me. They remind me very much of Narnia. They just haven’t shared the same fame. I’ll have to admit they reminded me a bit of the Unicorn Chronicles too — Loved that series and Narnia! Unicorn Chronicles…that’s a new one to me. Bruce Coville’s “Unicorn Chronicle.” It is a four-part series. First book is “Into the Land of the Unicorns,” followed by “Song of the Wanderer,” and two others. What a treat. Could not put the down.